Honey gold drips down from Palia's pale, only lightly-weathered head in slightly frizzed, wavy locks, generating a length of hair down to her her breasts that, in the proper light, glows to a near sunshine yellow. Melodic gray eyes, rounder and brighter than even some youths' are centered on her round, but not-quite pudgy face, framed by light brows and a soft, crinkling matte of wrinkles that defy the lack of maturity the aged rider has picked up over the Turns. Her nose is petite, dappled with a few freckles; a crescent shaped scar bears the same length, tracing down her left, rosy cheek to edge of her full lips. Built like a rider, but only barely so, she is still thin even from childbirth, but with an ungainly bosum that, with her height of 5'2", seems almost disproportionate to her frame. While certainly tamed down from her past turns, Palia's clothes are still brighter than any normal Pernese would dare wear. Bold azure colors the jacket of her riding leathers, which are high in the neck with fur poking out, and hang down to mid-thigh, belted over with her trademark lime-green riding belt. She keeps a pair of heavy wherhide gloves tucked into the back pocket of pale-beige riding pants, that tuck deep down into dark brown boots that reach almost to her knees, with brass buttons running up the sides. ………flirts with her daughter's boyfriends. It's impossible for me to sit here and dissect every fragment of Palia's personality, because that's like attempting to slice a peach cleanly with a plastic knife; it's very messy, and completely unnecessary. Most of you that would even read this are pretty aware of her outward personality; to sum it up into one sentence, she is a very bright girl with severe annoyance problems, attention and memory issues, entirely too much emotion on scales that would kill most humans, and an addiction to alcohol and bright colors. The side that few see is that at the core of all her sloppy outer peachy fruitiness, there's a seed casing that's full of the pieces of a shattered heart. I can only say that a lot of her emotional issues come from the fact that she never had a lot of her emotions reciprocated. When she became a rider, she had few friends, and even fewer people who wanted to be her lover; to try and prove some self worth in being a person worth someone's time, she pursued X'ian—probably the easily most difficult person to receive affection from, and therefore the person that would effect her persona the most. It also didn't help that she's insanely attracted to scruffy-looking men, and he was dumb enough to do just-nice-enough things for her that she kept tagging along after him for far too long; it could also be because her player is masochistic and likes watching her characters suffer, especially at the hands of another player whose writing talents I greatly respected. Neither of her children ended up liking her very much, either; Rannilos did the most, but only to abuse her generosity and alcohol stores. If you look at Elliot Reed from Scrubs, who she was initially based on, it's easy to see why she had so few people liking her; it's really hard to like someone that annoying and socially-stupid. In the end, her friendship with Tye is a very Elliot-Carla-esque relationship; one is an emotional pinball, the other an in-your-face kinda girl with an attitude and motherly protection. They have an intense bond of friendship, even if they drive each other mad-dog crazy every now and then. This recent development with Cr'ash ended up probably being the final key in stabalizing Palia so that her insecurities and growing insanity don't consume her to the point of losing Veriameth, and likely her death. This is very convenient, because while I had planned to officially decease the character once I Impressed my second rider, she's grown back into my heart as my favorite character yet again, and I'm not sure I can part with her just yet. Palannia, fondly only known as Palia, was never one to be tied down; to family, certainly not, so at 16 she joined the Herdercraft for a new experience, new thrills. Strangely enough, she started out quiet the shy one, but over several Turns of intense experience — a sea-journey to Southern, a failed candidacy at High Reaches — she developed into quite the ball of enthusiastic energy. Her sorrows were drowned in a Journeyman Herder knot, allowing her to practice the runner racing she loved; but the Firelizard Plague brought her duties back to 'Reaches, and after several confrontations with dragonriders, was given an ultimatum of suffering; she chose the lesser of two evils, and Stood for a second Clutch. It was there on the Sands she met green Veriameth, changing the course of her life for good. Drama ensued over the prevailing Turns, with mislead love for a bronzerider X'ian, and becoming a downright annoyance in the Weyr with her whiny attitude and inability to shut up. It finally got to her, one season, when a drunken encounter with X'ian lead to the birth of her daughter, Denalia, named instead for Palia's other clutchmate D'nik, to hide the identity of the father from himself, and later on, herself as well. 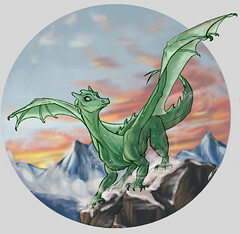 Rannilos was born later after a mating flight to brownrider R'um, whence she completely disappeared from appearance. That is, until several Turns later, when the end of Thread was near, a nearly fatal fall and concussion began her on a path of forgetfulness, and what many believe to be insanity. For the safety of herself and the wing, she was made an assistant weyrlingmaster, or rather "moral support advisor", to ensure her shortcomings didn't lead to further trouble. Under the aide of her supportive lifemate Veriameth, and the watchful eye of mindhealers, she has slowly been drifting away, but still maintains a sense of optimism and the youthful vigor she once was. Adding to such, at the ripe age of 42 she gave birth to another daughter; while it was T'ii's, as the result of a mating flight, her confusion lead her to believe it was bluerider Cr'ash's instead, so the girl was named Paleshia. Thus, now with the family she never thought she'd have, and the abundant friendships that were thought to be impossible — especially her special heart-to-heart connection with bluerider Tye — the blonde aging woman is set to live out what days she has left. There were scares her mind might be lost forever (such as when Weyrwoman Frusha exploded at her), but the endless determination of her support group keep her the Palia the all have come to love and bemoan. Winter's thaw breaks frost from the tiny blades of grass that tickle great ice-green dragonwings and chill the ashen-blue mountain creeks that splash across her 'spars. Valiant sproutlings push up through wingsails' glacial depths till tiny, tremulous blades of green patina the stark ice beneath. Those frigid tones crag her lean frame and loom evergreen over the palest arctic tundra below, a stolid presence over her back and chest before the forest casts shadows upon her sinuous neck. Spring's wane light sprinkles through the pine to dapple her shoulders with saffron light, sunshine and renewal bring change from the dreary cold to high summer's heat with swift alacrity. Grass clippings and oak works up her spine to drape the summer solstice, wisteria, and lavender across her headknobs and trailing vines tickle her delicate features. Fate's hand has designed this dragon a swift turn of the seasons: always changing, yet forever the same. Straps of sparkling white, with light and dark azures contrasting in tone for edging, circle about Veriameth's neck and chest regally. They're well-oiled, and able to seat one or two passengers. Sun hued gold covers over atop a slinky lizard, tinged with speckles of burnished gold, that turning hide darker where it touches. An elegant head is dappled with the bright color, touching over headknobs and eyeridges with just a sprinkling of the darker color touching those. Eyes touched with sky's deep blue are often curiously changing colors as emotions seem fit. Golden hue drips down a long, elegant neck to cover over a lanky, graceful body. Ticking of darkness climbs up her paws, dark and deep on all but one forepaw and lightening as it reaches towards elbows and knees, and then shoulders and hips, looking that bright and shiny, sunny golden color again. A line of molten gold lies along her ridged back to climb up her nearly transparent, iridescent wingsails and darkening wingspars. The odd thing is she has one whitish paw, as if she either has a stocking, or is missing one. Swathed in a bright, cheery blue, this firelizard is a bold example of his color. Rounded in proportions, he's got comparatively short and stubby legs, each of which are dipped in a creamy paleness, tinged just /slightly/ yellow. This same colour is evident on his belly, streaking upwards into jagged spikes which end mid-ribcage. His wings have to be just that bit too big to support his bulk, and their very edges are tinted with a light yellow dusting. A strip of black and blue on one forepaw denotes Guppy as a Reachian firelizard; on his other, a strip of lime green, recognizes him as one of Palia's brood. Pompous is the word that best describes this little firelizard. Stretching out a wing for all to admire, you can tell that she herself is her biggest fan, just by the way she looks at her long, elegant wings. But she has reason to love herself so, she has to be the most beautiful hatchling you've ever seen. Sleek hide dappled with sunlight ripples smoothly over clenching muscles, that are built not heavily with strength, but speed. Klah was evidently scoured into his cinnamon hide, dark as night across his stretched nody. Only now rows of streaks of a lighter tint place themselves to and fro from his back to the tip of his tail. Headknobs doused in copper lie back from his muzzle tip, that is ringed with dust color, and eyes edged the same. The brown's wings expand wide and far to extend in monotonous sails and chocolate dipped tips. Largest of the large, this young hatchling is; red, whirling eyes like ancient fires survey the crowd, searching for one who is worthy. Unfurling wings like giant sails, the young hatchling leaps with haunting ease from the nest, his russet-touched body shimmering. Quickly, upon huge paws, he stalks among the crowd, his blunt, thick muzzle questing. Headknobs like a feline's ears seem to twitch, long, graceful tail swings slowly, reddened spade tip flicking hyptnotically. A wild, harsh bugle rips from his throat, resonating across time.